We have a great giveaway today for anyone who likes playing with LEGO and reading books – now you can do both at the same time. The LEGO® : Build your own Adventure series by DK combines great ideas for building with exciting stories. Get inspired to build with creative specially-themed story starters, then play out your own adventures using your LEGO bricks. Comes with bricks that can be used to build an exclusive model that appears throughout the book plus a LEGO minifigure. Each chapter is packed with inspirational model ideas ideal for all ages and building abilities, with a mix of easy, medium and harder models. Suitable from age 6 and up. 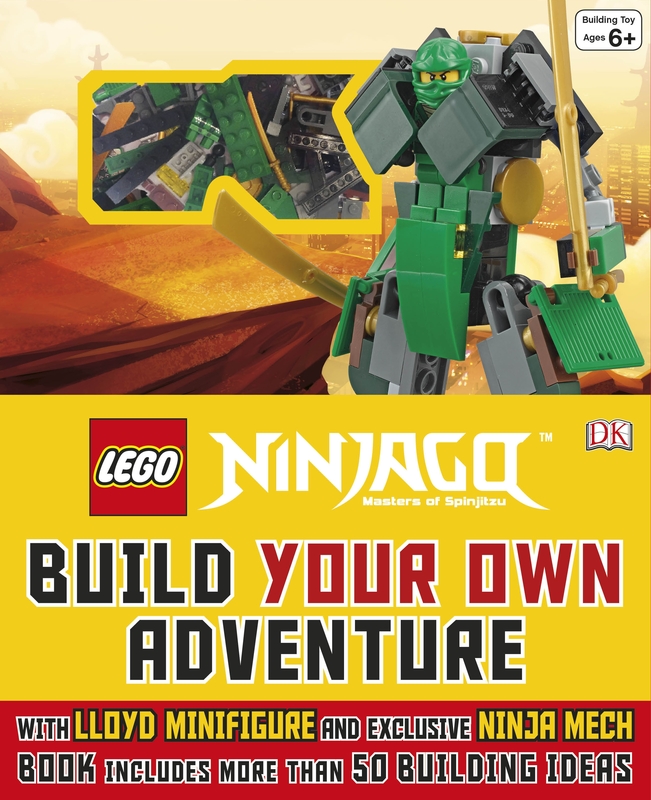 Four winners will each receive a LEGO Build Your Own Adventure book at random, published by DK and worth £17.99 each. You will either receive the LEGO Ninjago version or the LEGO Friends version. These brand new books are not even out in the shops yet, and are due to be published on 3rd August 2015. I would love to win, either for Flynn my son or Melody my daughter, depending on which one I receive. We love building Lego in our house! We are a family of Lego lovers so this prize would be a hit in this house! My sons have recently really got into LEGO and they are learning to cooperate and work as a team with their LEGO projet so would be a fab prize for them! Who doesn’t love Lego? My daughter and I would be pleased to go on an adventure with Lego! I’d love to win so I can get playing with my niece, she’d love this!! I would love to win as I would save it for my sons birthday, you cant beat lego on your birthday! I’m not quite convinced my nephew and my niece are well introduced to Lego’s world and this would be a good start for them. One of my kiddies would love this prize. So I can introduce my grandson to the wonder that is lego. My son is such a huge Lego fan, I’d love to win this for him! My nephew absolutely Loves LEGO so he’d love these! Id love to win because my Niece would love this! My son loves Lego, so would love this prize! I want to win for my nephews who love lego & would enjoy using this book. Both my little monkeys love Lego. For my son who loves LEGO! My grandsons are Lego mad, would love to win for them. I would love to win the Lego Friends book for my daughters birthday. My beautiful daughter loves it¡! Lego is my Son’s favourite! My son is a Lego addict so new sets always earn me brownie points! Awesome! My son LOVES Lego! My nephews love lego – so I would be a very popular auntie with this win. I’d love to win because my daughter loves Lego. For my kids who would love this. Our DD absolutely loves Lego Friends & would love 1 of the books featured. I’d love to say I’d hope to win this for my son… but his Dad would be just as excited to receive this! I’d love to win this for my little girl and her father to play with. Because Lego is the best and i know my Daughter and her cousins will love it! my daughter is lego mad, her nan made a box up of all the old lego he had and she is always playing with it, she would love this. My boys love Lego, especially Ninjago so winning this would be wonderful! My son is obsessed with lego so would love to win for him! I’d love to win for my Daughter, her new love is the Lego friends collection! It’s taking over our house! I would love to win as my kids all love Lego. My little girl has just discovered the awesomeness that is Lego and would love to win! I would love to win this to give to my cousin who would love it. I want to introduce Lego to my young daughter as It was a favourite for me as a child. I think my daughter would enjoy one of these sets. I would love to win because my kids love Lego. i would love to win for my daughters they would love this!!! Because my Grandson suffers from LEGOMANIA – you cannot get into his bedroom for the stuff!! I have a Lego mad grandson! We have a legofan of a son too! Lego is hours of endless fun, my little boy will be proper chuffed! This would give me hours of peace when looking after my 9 year old grandson and give me unlimited access to my pc! We are just about to make the change from big megabloks to real lego, so this would be super to win. My grandson would love this, who his lego mad. I would love to win this for my two children!! I would love to win this for my son, as he’s a big lego fan. To bribe my son in the holidays! because lego is very popular in this household .. even the kids like it!! All my grandchildren love playing with Lego. They usually bring some with them when they visit.They would all like me to win this prize for them to share. For my children they would love them. I would love to win because my 6 year old is absolutely obsessed with lego at the moment and this would be a great treat for her for doing well at school and just for being great! Would be great to have some Lego adventures over the holidays. I would love to win this to come up with some new lego ideas for my son and daughter… They’ll love it. It looks nice for my sisters child. I’d love to win because I have great memories of lego from my childhood and this prize would be a great start to my daughter developing her own! My grandchildren absolutely love Lego. We love Lego in our house, especially my two little boys, to win this would be great. Thank you for the opportunity. I grew up on lego and would love to be able to give my family the same. My 6-year-old has just discovered LEGO, and as a big fan myself I know we’d have lots of fun reading these books together.